During an interview with CNN on Wednesday, March 9, 2016, Trump said that "Islam hates us" and that the invasion of Iraq was the "worst decision in the history of the United States" and turned the Arab nation into the "Harvard of terrorism. " Source: CNN. There is nothing more dangerous in politics than historical omissions, and President Trump keeps making this errors. 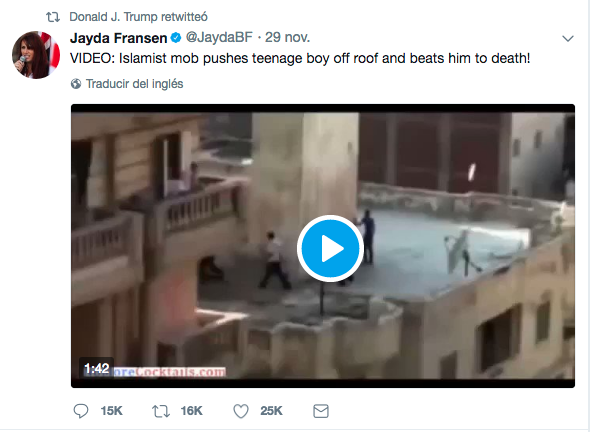 But this time his inadequate behavior stepped on foreign territory when he shared via Twitter three incendiary videos published by a British far-right account and showing anti-Muslim propaganda. Jayda Fransen, leader of Britain First (an ultra-nationalist and far-right political group) originally published the videos, which showed Muslims attacking people and breaking Christian icons, according to CNN. The US president didn’t measure the scope of his media profile - when he has around 44 million followers on Twitter - and proceeded to share the videos, showing an open endorsement of racism. The reactions were immediate and a large part of the English citizens was offended not only by the meddling of a foreign president in internal affairs but also by the open ratification of the racist positions of the US president. The most important British national media condemned Trump's actions, and Prime Minister Theresa May issued statements in front of the media assuring that, although both countries agree to work together, "we are not afraid to say when the United States has got it wrong", sentenced May. "And I’m very clear: the retweeting from Britain First was the wrong thing to do”. The British PM wanted to clarify the type of relationship between the two countries, making diplomatic emphasis on the borders of bilateral collaboration, ensuring that "this is a long-term special relationship that we have. It’s an enduring relationship that it’s there because it is in both our national interests”. She also assured that the invitation offered to the American president to visit England is still standing and that the White House had already accepted it. For his part, Trump defended himself on Twitter urging May to "worry about the Radical Islamic Terrorism that is taking place in the United Kingdom." But public opinion in the European country has made it clear that the incendiary comments of groups such as Britain First do not represent national positions, but rather instigate "the division of communities through their narratives full of hatred." "The British people strongly reject this prejudicial rhetoric of the extreme right, which is the antithesis of the values that represent this country: decency, tolerance, and respect," said a spokesman for the Prime Minister. English history with immigration is far older than the US president remembers, and the integration of foreigners in the United Kingdom has been a slow and successful process. You just need to see the reach of political figures with immigrant origins as Sajid Javid - member of the conservative government of May - and the first Muslim mayor of London, Sadiq Kahn, who assured that the US president is mistaken in endorsing "vile, hate-filled racist organization” that rejects immigrants and that his invitation to the country should be" revoked ". But the seriousness of the president’s retweets falls punctually on the historical importance of political propaganda. Who doesn’t remember the success of Joseph Goebbels in the German campaign between 1933 and 1945? Or the racial campaign in the United States after Pearl Harbor in December 1941? At that time it was the Hebrews and the Japanese who suffered the stigmatization of the media. Seventy years later, it is the Muslims who are represented in a radical and offensive way through social networks, the new platform for world propaganda. Has the distance between Roosevelt and Trump been in vain? The risk of discrediting the power of images in politics and using them unconsciously could radically change the course of history.